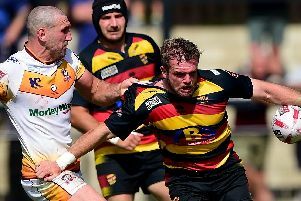 Twelve-man Sheffield Eagles fell to a 18-22 defeat at Swinton Lions in a crucial showdown at the bottom of the Kingstone Press Championship. The Eagles slipped to their sixth consecutive league defeat, with centre George Tyson sent off in the second half with his side eight points in front. Tyson was given his marching orders by referee Tom Grant after dangerously planting second rower Connor Dwyer, with the official producing the red card after consultation with his touch judge. The Eagles then failed to hold their advantage, leaving Mark Aston’s side with just one win in their last 10 in all competitions. The Eagles were slow out of the blocks and were behind on five minutes when Matty Beharrell’s kick was taken by Rhodri Llloyd who grounded for the opening score. Chris Atkin added the extras. The try did little to liven up the Eagles as their error- strewn opening allowed Atkin to extend Swinton’s advantage when he slotted a penalty in front of the sticks. The hosts again opted for the two points on 18 minutes when the Eagles were penalised for offside, as Atkin kicked the home side into a 10 point lead. Previously lacklustre Eagles suddenly kicked into life on 27 minutes, bagging their opening try with their first real move towards the Swinton line. After Matt James was held, the Eagles powered over on the next play through Adam Neal, but Cory Aston missed the conversion. Two minutes later a rejuvenated Eagles side were level. Rob Worrincy made the break down the flank, before handing over to Ben Blackmore who sprinted over the whitewash. Aston converted. The visitors then completed a remarkable turnaround when Aston successfully kicked a penalty just before the break after Swinton were penalised for being offside. The Eagles pulled further clear when a clever break gave the visitors prime position and they took full advantage with Quentin Laulu-Togagae dancing his way to the try line, with Aston successfully converting. With the Eagles sensing a rare victory, their chances were dealt a blow when Tyson was sent off and during the ensuing handbags, Swinton’s Macauley Hallett saw yellow for the home side. Swinton then set up a grandstand finish when Lloyd barged his way over for his second try, and Atkin again converted. The 12 men held out until the 70th minute, when Swinton broke through for a crucial score. Atkin’s pass found Dwyer who sailed over the whitewash, and Atkin converted to give the hosts a four-point cushion which they successfully held despite late Eagles pressure. Swinton: Fell, Robinson, Lloyd, Hallett, Marshall; White, Atkin; Hand, Beharrell, Lever; Thornley, Dwyer; Fleming. Interchange: Bracek, Austin, Barlow, Halafihi. Eagles: Laulu-Togagae, Worrincy, Yere, Tyson, Blackmore; Aston, Hewitt; Thorpe, Carlile, Mexico; James, Straugheir; Knowles. Interchange: Fozard, Wheeldon, Neal, Minchella.